Czech Republic is a popular European destination… perhaps not as popular as France or Italy, but still popular in its own right. Yet, most visitors to the country don’t stray too far from the capital city of Prague. Although Prague has stolen my heart, and would probably be one of my top 5 must-visit destinations, there is definitely more to Czech Republic than Prague. 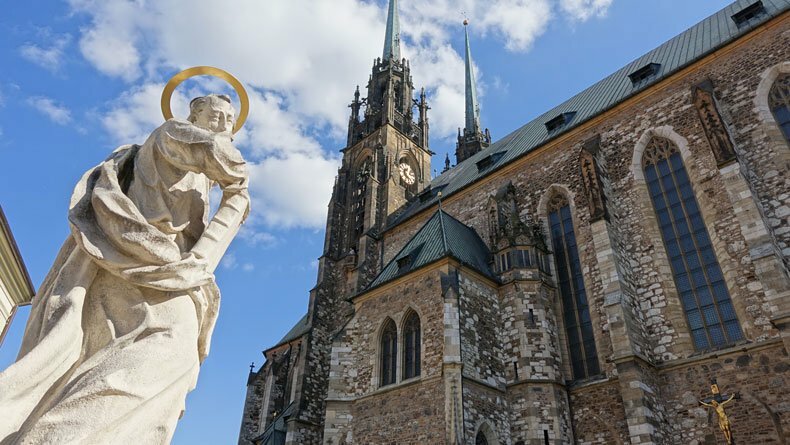 In the southern part of the country, in the region known as Moravia you’ll find the Czech Republic’s second largest city, Brno, which is definitely worth a visit, as well. During our last trip to Europe, we rented a car and drove across Germany, Austria, Poland and Czech Republic. Since we were traveling with a toddler, which makes any trip exponentially more challenging, we decided not to spend more than a couple of hours in the car at a time. For this reason, we decided to stay a night in the little known town of Brno. Brno really isn’t on the radar of many travelers, and I didn’t know what to expect when I booked our stay. But it turns out there are several intriguing points of interest in Brno, Czech Republic and quite a few things to do in and around the city. We were pleasantly surprised by all Brno had to offer. Brno is much smaller than Prague, and because it isn’t really a tourist town yet, its way less crowded. Don’t get me wrong, you will find plenty of tourists in Brno, although most of them won’t be American. I’m guessing many of the people who are visiting Brno come in for a weekend from some of the smaller surrounding towns or neighboring countries. Still, in comparison, Brno has significantly fewer people walking the streets than Prague. Even though it may not be a tourist destination, the city has done a really great job of beautifying the old town area. From the architecture to the cobblestone streets and street cars, the town is dripping with charm. 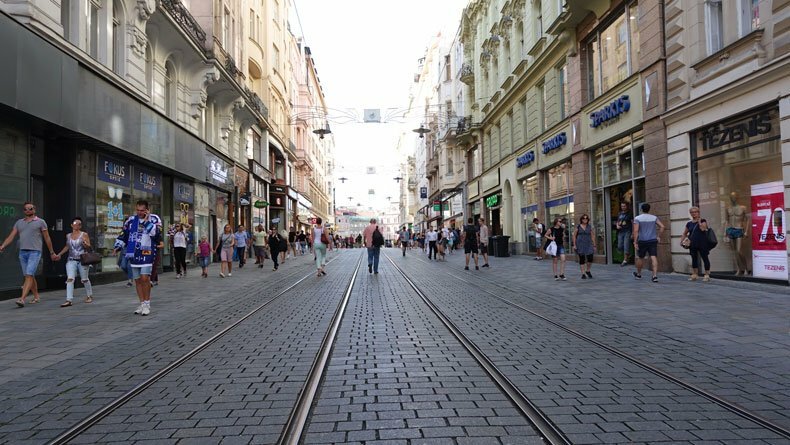 One of my favorite things to do in Brno, Czech Republic is simply roam the streets and shop. Just outside of Brno, Czech Republic there is quite a bit to do for adventure and nature lovers. This region of the country has beautiful fields and rolling hills. 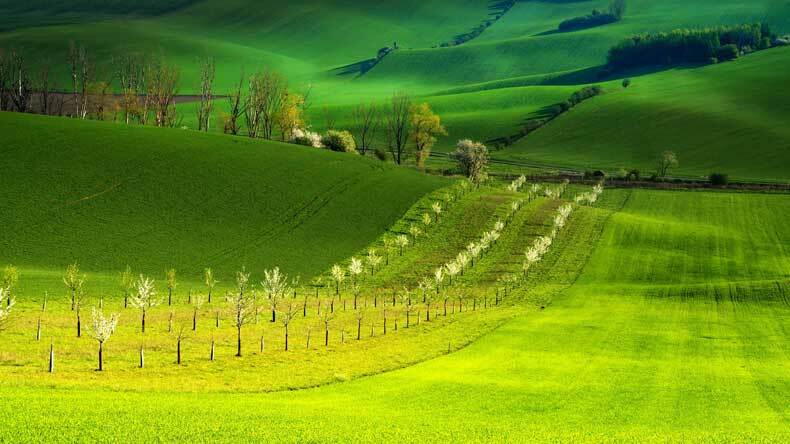 In spring and summer the fields are vibrant shades of green. And in fall, the rolling landscape changes to bright gold and yellow. An amazing attraction just outside of Brno is the Macocha Karst, known mostly for the beautiful Macocha Abyss. Although the attraction is family friendly, there is a bit of hiking and a boat ride that kids will need to sit still on. Our toddler was not old enough yet to sit still on a boat ride, so we missed out on this amazing day trip. It is definitely on our list for when she gets just a little older, though. It’s safe to say businesses in cities that cater to tourists mark up prices to make a good profit. That’s why cities like Paris and London are outrageously overpriced. People will pay it. In contrast, places that haven’t been pegged as tourist attractions tend to offer better rates on hotels, food, and basically everything else. 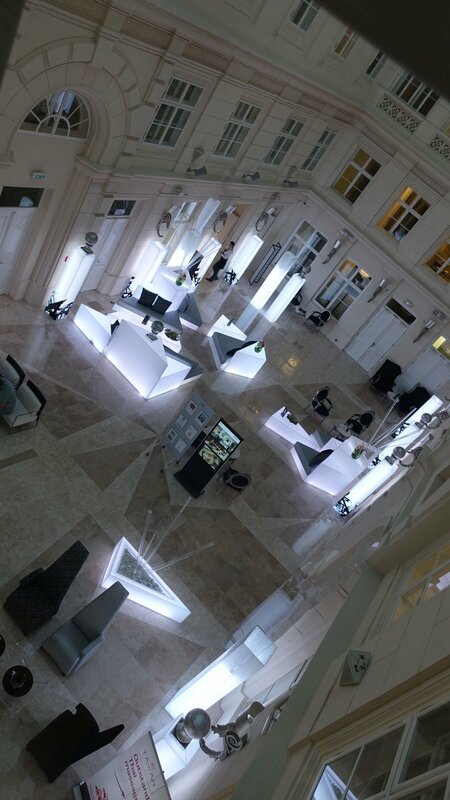 In Brno we actually splurged and stayed in the most expensive hotel in the town. It was nice! They even served us complimentary champagne when we walked in. But you know what? It was still the cheapest hotel in which we stayed during our entire European trip. We grabbed dinner from a street vendor and spent about $8 US for our family of three. We ordered three gelatos for the equivalent of $3 US. Your money will go fairly far in Brno, Czech Republic which makes it all that much more appealing! Brno’s Old Town is somewhat small, but surprisingly there is still a lot to do and see. One of the main highlights of Brno is the Cathedral of St. Peter and St. Paul. It sits perched on a hill, towering above the city. Aside from this church, there are several others including Capuchin Monastery which houses the mummified remains of monks and nobles, and the ossuary underneath the Church of St. James, which is basically a small chapel made of bones and skulls. Kinda creepy but cool. So is Brno, Czech Republic worth visiting? In our experience, Brno is definitely worth spending a day or two. There is enough to do in and around the city for a great weekend trip. Since it’s relatively close to Prague, Vienna, and Bratislava, you can easily visit Brno on a trip to any of those wonderful cities, as well. Have you been to Brno, Czech Republic? What is the best little-known town you’ve visited? I was hoping to visit Brno at the tail end of my Euro rail trip a few years ago because the flights back to Uk were cheaper there than from Prague. However, our itinerary was so jam-packed that it ended up being a lot easier to pay the extra and just fly from Prague, which is a shame as I would have loved to see Brno! It looks like a beautiful place and I just love lesser-visited cities which often turn out to be hidden gems! I totally agree. The smaller, lesser known towns always end up being a trip highlight for us. This is great. I love less expensive locations that are not tourist Meccas. Brno looks very quaint and was not on my radar at all. But the region outside the coty looks amazing. And the cathedral looks beautiful. Thanks for the share! The region is absolutely beautiful there are also a lot of rolling hills that turn almost an unnatural yellow color in the fall. I’m assuming it is a crop that they are growing, but it is so pretty. Brno looks like a lovely little city. 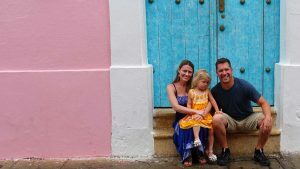 I have actually been thinking about visiting the Czech Republic this year; I travel with my wife and two kids, and I know what it is like to travel with a toddler – not always the easiest. If I go to the Czech Republic it will be for a long weekend (4 days) and if prices are good in Brno then I may just head there. Thanks for the info. Good post, and good luck on your travels! Thanks! You will love Czech Republic. It’s one of my favorite countries. Enjoy your trip! A very interesting post, I’d never heard of Brno until I read this. What sounds good about Brno is that the best hotel is cheap, I’m now thinking the mid range hotels much be super cheap. I’ll use this idea in other European cities too. 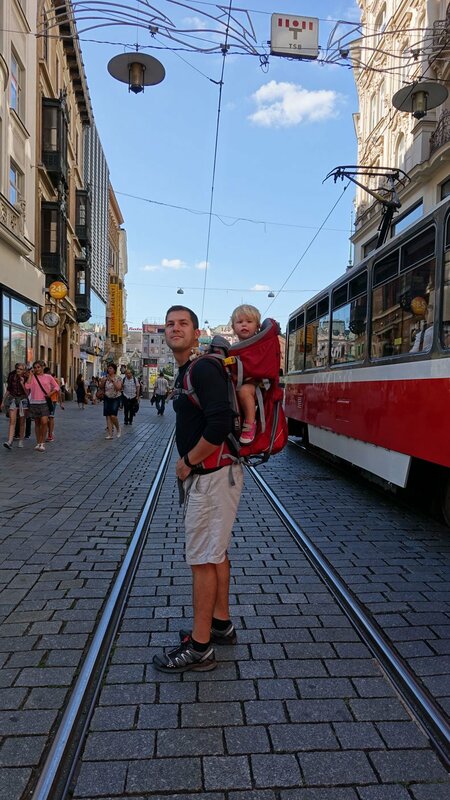 It looked like a great trip, I love the pic of daddy with the baby carrier, a great workout! The baby carrier is a must-have for families! And yes, the mid-range hotels are super cheap. It’s a great place to visit! I went to Czech Republic almost two years ago now and I fell in love with it as well. Due to time restrictions I didn’t have a chance to explore this beautiful country any further, but plans have been made to return. 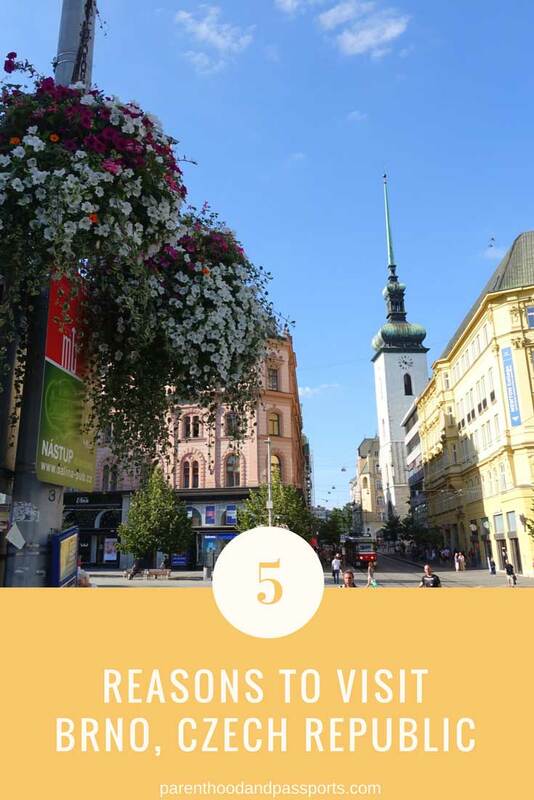 I will definitely go to Brno after reading this and finding out it’s cheaper and less crowded and with the surrounding nature for a hiker lover like me-it’s like a cherry on top! You got me at less crowded. I haven’t heard too much about Brno but everything I’ve heard has been positive. I love that there is a lot of beautiful nature surrounding the city too. I’ve yet to make it to the Czech Republic but am hoping to have the opportunity sometime this year. Thanks! Yes, our little one is a seasoned traveler. She goes everywhere with us. Even she really liked Brno. It’s definitely charming. Put it on your list for next time your in Czech Republic! Very interesting read! Traveling around Europe can be expensive so it is good to know of a place that your money can go further! Brno is definitely one of them. We found Poland extremely affordable too. Always looking for places that are affordable to travel to. Thank you for a wonderful peek into the Czech Republic and Brno. The whole country is really amazing. I wish we could have spent more time exploring it. Brno looks amazing!! I really enjoy traveling to less popular areas just for the reasons you mentioned above! 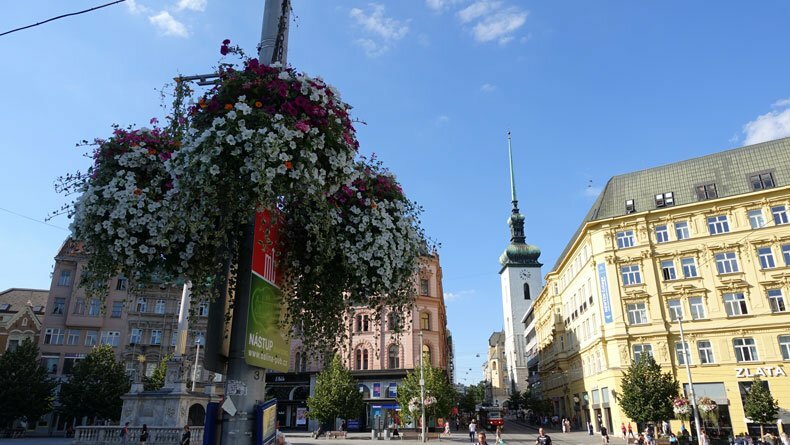 I’ve never heard of Brno so I loved reading this post! It’s always nice to hear about cities that aren’t as well known. It really does seem like a charming city and I hope to visit one day. And your toddler seems like such a little explorer! The architecture there is just stunning, Id love to visit the Czech republic….hopefully someday! Great pictures! I loved this! When we visit places we love staying in new or places off the beaten path (or top list). Your reasons make this a perfect destination for us. We especially love places with a little city and a little nature. Thanks for the great write up! I’d heard of Brno before, but didn’t know much about it. Cesky Krumlov is at the top of my list for my next trip to the Czech Republic (and I’d of course love to go back to Prague). But the Macocha abyss looks amazing! Why don’t more people know about this? I was wondering that, too! I bet it becomes a tourist hot spot one day. The area is too beautiful to stay undiscovered. I am sad to say I have never even heard of this town, totally off my radar. I like to travel slow and really get to know the places I am in before moving on, so I pick a city and then see as much of it and the surrounding area in as much time as I can squeeze out of a visa. This looks like a great home base! And more affordable too. Wow I recently met someone from Brno but never realized what it looked like until I saw this post! It looks like a lovely place to visit… hopefully I will have the opportunity to go there one day! 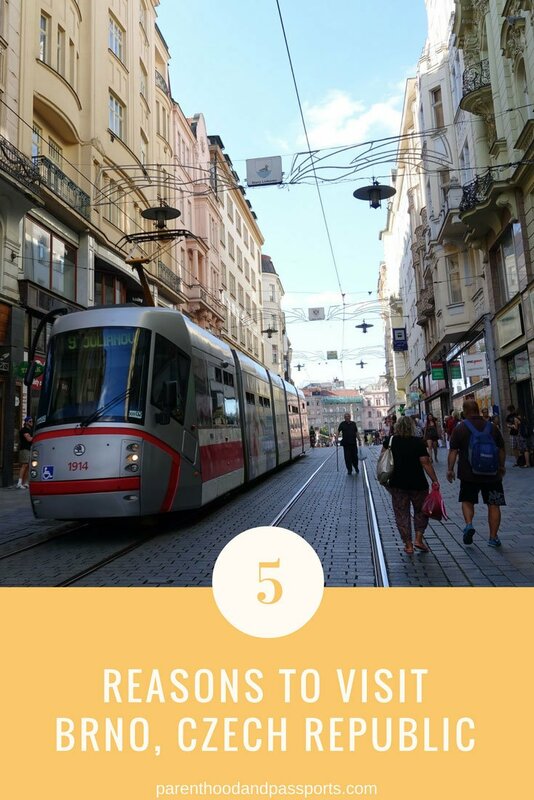 What a lovely read about my favourite city 🙂 I am from the Czech Republic, living in Prague, but I love to visit Brno at least once a year because of all the reasons mentioned in this post. Thanks for commenting! I’m so glad to hear you love Brno as much as we do! I look forward to returning to explore even more of Czech Republic someday. Brno really seems to be an amazing place. I am definitely adding it my travel bucket-list.